A sutra is a religious teaching, usually taking the form of an aphorism or short statement of beliefs. Sutra means the same thing in Buddhism, Hinduism, and Jainism; however, the actual sutras are different according to each belief structure. Buddhists believe the sutras are the teachings of Buddha. Sutra is a Sanskrit word meaning "thread" and is synonymous with Pali, the religious language of Buddhism. Originally, the word was used to identify oral teachings thought to have been given directly by Siddhartha Gautama (Buddha) around 600 B.C. The sutras were originally recited from memory by Buddha's disciple, Ananda, at the First Buddhist Council. Ananda's recitations, called the Sutra-pitaka, became part of the Tripitaka, which means the "three baskets," the earliest collection of Buddhist scriptures. The Tripitaka, also known as the Pali Canon and originally passed on orally, was first written down about 400 years after Buddha 's death. 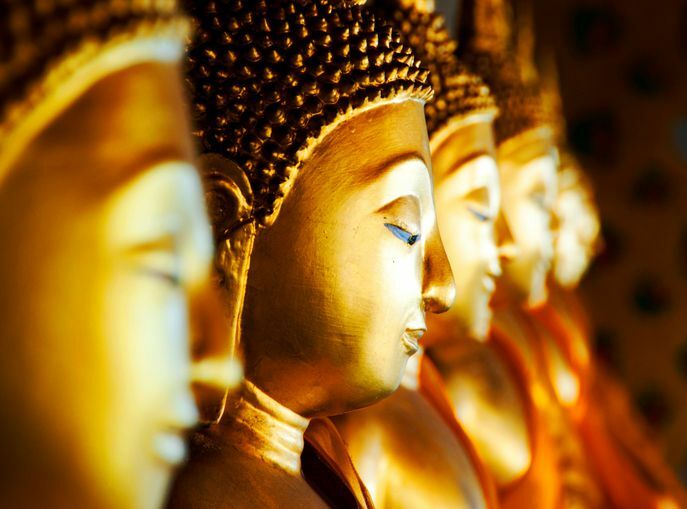 Theravada: In Theravadan Buddhism, the sutras in the Pali Canon are thought to be from Buddha's actual spoken words and are the only teachings officially recognized as part of the sutra canon. Vajrayana: Practitioners of Vajrayana (and Tibetan) Buddhism believe that, in addition to Buddha, respected disciples can, and have, given sutras that are part of the official canon. In these branches of Buddhism, not only are the texts from the Pali Canon accepted but also other texts that are not traced to the original oral recitations of Buddha's disciple, Ananda. Even so, these texts are thought to include truth emanating from Buddha-nature and thus are regarded as sutras. Mahayana: The largest sect of Buddhism, Mahayana, which branched from Theravadan Buddhism, acknowledges sutras other than those that came from Buddha. The famous "Heart Sutra" from the Mahayana branch is one of the most important sutras that did not come from Buddha. These later sutras, also regarded as essential texts by many Mahayana schools, are included in what is called the Northern or Mahayana Canon. gate, gate, paragate, parasamgate, bodhi svaha"
There are some texts that are called sutras but are not. An example is the "Platform Sutra," which contains the biography and discourses of the seventh-century Ch'an master Hui Neng. The work is one of the treasures of Ch'an and Zen literature. Although acknowledging its beauty, most religious scholars agree that the "Platform Sutra" is not a sutra, but it is called a sutra nonetheless.